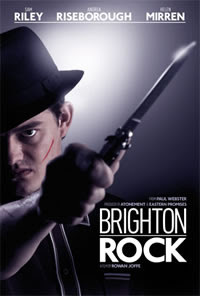 The 1947 classic version of Brighton Rock is based on Graham Greene's novel of the same name and features Richard Attenborough as Pinkie Brown in a seminal role and Carol Mash as Rose Brown the girl that he marries to stop her from talking. Pinkie Brown is a small-town hoodlum whose gang runs a protection racket based at Brighton race course. When Pinkie orders the murder of a rival, Fred, the police believe it to be suicide. This doesn't convince Ida, who was with Fred just before he died, and she sets out to find the truth. She comes across naive waitress Rose, who can prove that Fred was murdered. In an attempt to keep Rose quiet Pinkie marries her. But with his gang beginning to doubt his ability, and his rivals taking over his business, Pinkie starts to become more desperate and violent. The new version is due for release on 4 February 2011. Rowan Joffe's remake goes back to Graham Greene's novel and this time around stars Helen Mirren staring as Ida Arnold (the role originally taken by Hermione Baddeley), Sam Riley as Pinkie Brown and Andrea Risborough as Rose Brown. It also stars John Hurt and Andy Serkis It is set in the 1960s instead of the books original 1939. It's a 'we'll see,' isn't it? "Dickie' was great in the old version.